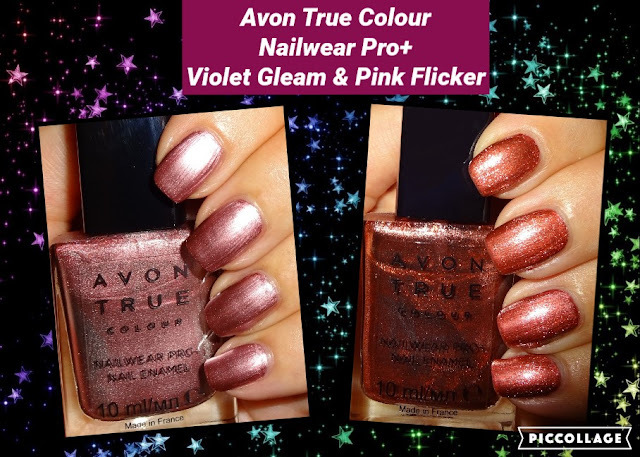 Christmas, followed by the New Year is just a few days away, so here’s a couple of sparklicious party season nail shades to show you from the Avon True Nailwear Pro+ range. First up Violet Gleam. This shade certainly does gleam, a pretty violet with white frosting. And if Violet Gleam isn’t bold enough, then take a look at Pink Flicker, a coppery red crammed with silver shimmer – woah! Both splendidly sparkly, you certainly get your shimmer on with these two. Two coats for full coverage, super formulation, good brushes, 10ml bottles. I’ve been informed by Avon that all their nail enamels are 5-Free (free of: Formaldehyde, toluene, DBP, formaldehyde resin, and camphor).